Add a little glitz to a homemade Fall wreath, using glitter to accent colorful autumn leaves along with felt pumpkins and pears. All you need for the base is a circle of corrugated cardboard which you can easily make yourself by recycling the side of a cardboard box or, even easier, cutting out a hole from the middle of a cardboard circle used to support a frozen pizza. This colorful fall wreath began with a cardboard form that I made myself. To make your own wreath base, decide on the size of wreath that you want then cut this circle from the side of a cardboard box. Next step is to cut out a circular hole in the middle of the cardboard circle to create the wreath form. There are many things around your house that you can likely use as a round template to draw around; the bottom of a round waste basket, for instance, or something similar. You could also draw a circle on cardboard using the tip of pencil that is tied to a string. Fasten the opposite end of the string to a drawing pin, or bulletin board pin, that you have stuck in the middle of your cardboard. Adjust the string length so that the pencil will inscribe the outline of your desired wreath size as you move it around. Repeat this exercise to draw and cut out the hole in the middle of the wreath, or draw around a smaller circular object, such as a saucer or plate. 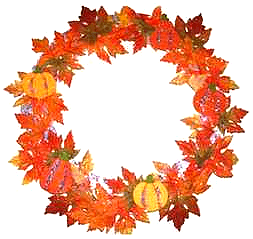 Once I had my cardboard wreath made, I added fall leaves from the store as well as felt pumpkins and pears in orange and yellow. I arranged the leaves in a pleasing pattern then glued glitter on some of the leaves. The leaves, pears and pumpkins were all attached with craft glue and, as you can see in the close-up photos, I glued glitter on the creases of the pumpkins and the pears. This is an easy fall craft project that can look beautiful displayed on a front door or entry way.